The Butcher is a minifigure Collectable Minifigure released in early 2012 as one of the sixteen minifigures from 8827 Minifigures Series 6. He comes with a new T-bone steak piece and a meat cleaver. The Butcher wears a lopsided cap. He has a smiling face with brown sideburns down his cheeks. 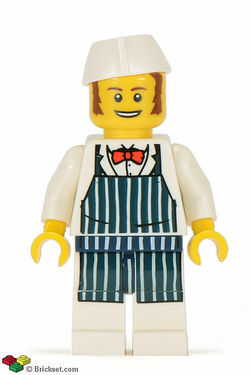 He wears a vertically striped navy-and-white apron that extends down onto his legs, a white shirt and a red bowtie. He has a new red and white T-bone steak and a new silver meat cleaver. According to his description, the Butcher is very cheerful and likes to chat, especially about meat. His sideburns are similar to the Cowboy's from Series 1. This is a description taken from LEGO.com. Please do not modify it. (visit this item's product page) “Howdy! How about some meat?” The Butcher is a cheerful chap in his tidy hat and apron, always happy to chat about the weather or pass on the latest news from town. But no matter how a conversation with him starts, somehow it always ends up coming around to the subject of meat. It’s really no surprise; after all, it’s the Butcher’s very favorite thing in the entire world. Whether you’re talking poultry or sausage, hamburger patties or a fresh T-bone steak, you’ll never find anybody who knows more about meat. Ask around and you’ll see! The Butcher is a cheerful chap in his tidy hat and apron, always happy to chat about the weather or pass on the latest news from town. But no matter how a conversation with him starts, somehow it always ends up coming around to the subject of meat. This page was last edited on 11 July 2016, at 23:41.